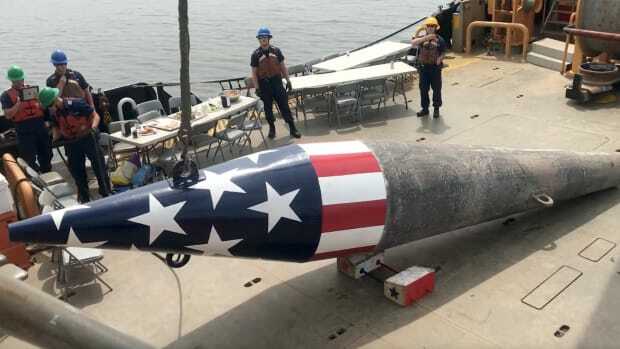 The crew of the Coast Guard Cutter James Rankin lowered the Francis Scott Key buoy down to its location Monday in Baltimore’s Patapsco River. The buoy marks the spot where the ship carrying Francis Scott Key, the author of “The Star-Spangled Banner,” was anchored during the bombardment of Fort McHenry during the War of 1812. It has been placed in this location annually since the 1970s. The crew of the Rankin is responsible for the annual placing of the buoy in the spring and for removing it in the fall. Click here for a video of the placement of the red, white and blue buoy.